Access-IS OCR315e and OCR316e are robust yet compact OCR (Optical Character Recognition) Readers. The devices are versatile and compatible with a myriad of devices. The concept of these OCR readers being so versatile is to give you the ability to “know your customer” and capture all of the applicable date as quickly as possible. 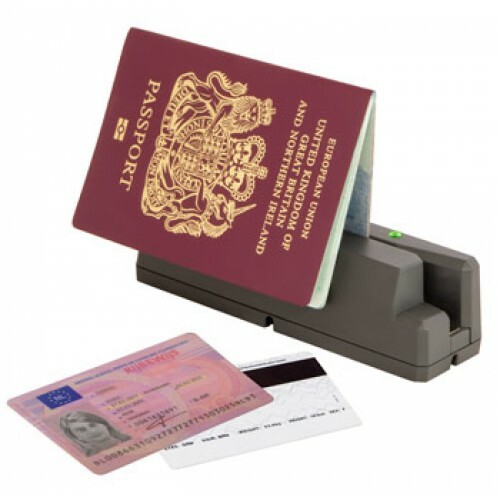 The flexibility of these devices offers a design that is optimized to operate with both passport and standard ID cards. The OCR decoder is based on an advanced recognition technology that provides rapid document reading. Communications Device Class (CDC) virtual serial and keyboard wedge options. Reads machine readable passports, visas and travel cards conforming to ICAO Document 9303. Bicolor LED and audible sounder providing good/bad read indication. Can be used as a free-standing unit, desk-mounted or attached to a range of monitors and devices. Multiple cable lengths and exit positions. The OCR315e (OCR only) and OCR316e (MSR & OCR) are compact and robust OCR readers. The devices can simply be attached to a variety of handheld and ultra mobile PCs, tablets, standard desktop keyboards and monitors, or act as standalone units as part of the check-in process. The interface connection is via USB. The track length and single slot design is optimised to ensure that passports and ID cards are correctly aligned for consistent and accurate reading.